There are days, sometimes whole seasons, where you stare blankly out the window at all that you’ve planted — every dream, every seed, every good deed, every tear-stained prayer. And it’s all blowing in the wind. You cross your arms tight around you, like it might be the only way to keep your faith from lurching out of your body. It happened like that for us, months after my father-in-law died in a hospice bed. He died in winter. We planted seeds in the spring. The plants grew tall. And then? It was autumn, the season of harvest, his favorite. His work boots were still dusty, one tipped over the other by his back door. His John Deere cap drooped, sad, on a nail. After he slipped away from us, my husband was left with all this grief, and all this land to tend. The crops grew tall that year, thickening over the rows so everything green was touching. There was something very beautiful and hopeful about that, like everything was going to be okay. And then came October. We awoke one morning to find all the crops tucked under a thick, white blanket of snow. Not a single plant had been harvested, but the snow had already come, so cruelly, intruding on all our hope. I wanted to cry. I lit a candle with the word HOPE on the outside. The match shook when I held it. I tried to pray. I pulled my arms around myself again. We lit more candles. Made comfort food, like pot roasts and mom’s soupy chicken in a 9-by-13 pan. The house smelled like pumpkin and cinnamon. Anna couldn’t read yet, but she copied words down onto a piece of paper, because she’d seen me write them into my prayer journal. She added the smiley face that I didn’t have. Her daddy kept that piece of paper on the dash of his pickup truck all autumn long. 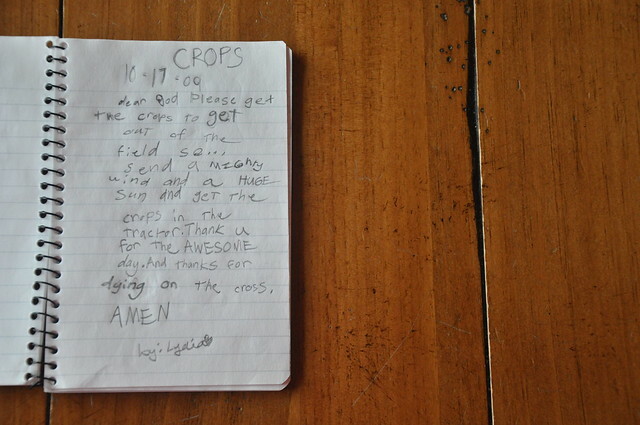 Lydia wrote out prayers, feeling along the edges of her burgeoning faith. She was eight at the time. I remember watching her, with her journal spread out in front of her, next to my HOPE candle, as she gripped the pencil tightly, like she could squeeze the lead out of it and will that “mighty wind” to tumble out of the sky. One afternoon, a farmer from up the road tapped his knuckles on the back door. I found him standing on the doormat, with his fists shoved into a thick quilted jacket with a corduroy collar. His old eyes looked softer than I’d remembered before. I can’t say for sure if I said anything else. I do remember how I didn’t want to cry in front of him. I was pretty sure that farmer had come by because he knew that my husband needed a man to stand in the place of the father who died, to let the son know everything was going to be okay. He came to let us know that it was still safe to hope. When I closed the door, I felt the knots start to untie themselves. I stopped hugging myself so tight. I stirred the soup. Set pottery on the pine table. Kept writing down words in journals, and sometimes I felt like my little Anna: not sure if I could really read what I was writing, but determined to keep stringing letters together, like those letters might sew me together so my faith didn’t fall out. It would be weeks later, before we saw the man’s promise about the harvest come to pass. The harvest came, and went, just like he said. We still have the cork from the wine bottle. I wrote on it with Sharpie, so we wouldn’t forget. And the HOPE candle? It kept on burning. While the earth remains seedtime and harvest shall not cease…Gen 8:22. Isn’t that an amazing promise! The man who came to your door, what a blessing. Yes. Thank you for this, Elizabeth. And that man? He died not long after. So grateful for his presence in our lives. He was a gift. We miss him so. Our faith has grown up alongside these crops, roots deepening with all that we’re planting in dirt. Thanks for being here, Rachael. 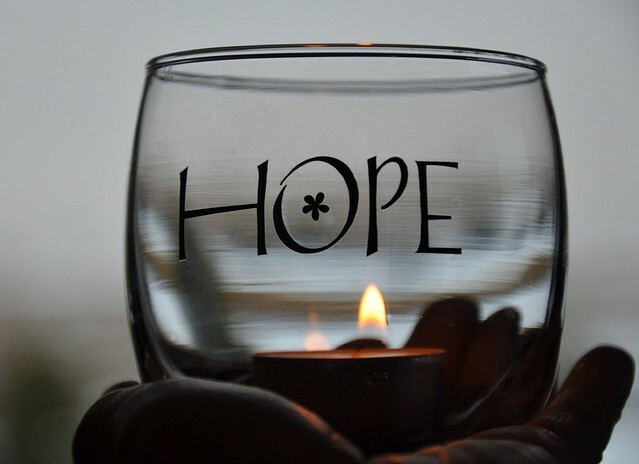 Love the phrase about the “hope outside” of the candle. Sometimes we are just like that on the outside hope is written but on the inside we are shaken and the candle is out. The man who came to your door must have seemed like an angel speaking life into you in the midst of such darkness. Blessings, to you! I miss that man. He was a blessing to our community and to our church. He has since passed away. Yes, the part about the old farmer is the best part. The encouragement of the elderly is the best encouragement because you know they know what they’re talking about. Oh yeah. That’s good, Amanda. Very good. Thank you. Thank you, Dolly. Always appreciate you here. God sent you and Scott the angel you needed to encourage you to hope. How beautiful! Linking up with you this week….my first time. Blessings to you. Leah! I’m so excited that you’ve linked with us. I love your heart. Hi Jennifer. Today, I made my link up with you first before I read. The last time, I did the opposite and almost forgot what I came here for. That’s what your heartwarming stories do to me :). “The harvest always comes.” And I’m hoping and praying this is true to our unsaved loved ones, neighbors, and friends, too! Praying with you, Rina. Thanks for being a part of #TellHisStory each week. That farmer brought hope to your family and to my heart! This is my fifth week of a severe Fm/CFS relapse and I needed to know that this season will also change. So the Hope candle in my heart just burns a lot brighter. You eight year old is adorable! Mia … Praying HOPE over you friend. Wow. Wow. Wow. And this. That the harvest always comes. That’s something to hang onto in all aspects of life. Beautiful. Yes…. I’ve been lighting the HOPE candle for so many friends this month — friends with bad diagnoses, wayward children, job loss, adoption troubles. So many people in need. I so needed these letters strung together into a beautiful flame of HOPE today, Jennifer. THANK YOU!! Your words wrapped around those of your neighbor…wow…God’s grace carried in on Lydia’s big wind…settling into the deep places of my soul. The harvest always comes in. Yes! So glad my words have found their way into such a beautiful place — your precious soul. Love you, Cindee. oh yes. the hope and faith of anyone who buries under the land, such brave and necessary hope needed. my grandpa was one of these men. he taught me more in his actions, working his garden than any preacher has been able to. love this. love you. Are there any people who embrace a hopeful life more than those that till the the soil? No wonder the Bible uses the metaphor of the seed so often, speaks of the harvest among us. I drove by a field white with cotton just days ago, it reminded of the greater harvest…Thanks for sharing Jennifer, for being a hope-giver here in this place. I absolutely love this story, Jennifer. How personal that God sent the angel-man at that time to give those words! We all need those messages, more often than we realize. I know I do. And I need to get me a “Hope” candle. 🙂 Love that. What a post…..how I needed it today. Everyday. Thank you so for your beautiful faith. Powerful testimony to God’s faithfulness. The words of the man, the faith of children, the love of family whether blood relatives or community or someone who truly knows and cares about another. I praise Him for the light that He lit in your household. “determined to keep stringing letters together, like those letters might sew me together so my faith didn’t fall out.” Beautiful imagery. My dairy farmer cousin writes scripture all over her bank statements when times are most trying. I call it red-lettering her circumstances. He, the Word, DOES keep your faith from falling out. This is lovely and filled with such hope. So glad I stopped by today. Oh, Jennifer, this is too beautiful for words. Thank you for sharing hope! I have been in seasons when it seemed like the harvest would not come, and yet–faithfully, slowly–it has. Thank you. I cannot imagine this life without hope – and the hope that comes from Him. You have such a gift dear one. Your words weave stories that find a place in our hearts – a familiar place. And we feel understood and blessed. This ministered to me so much today, Jennifer. Thank you. A verse that I’ve been holding on to this past year ties into your post — “There is surely a future hope for you, and your hope will not be cut off.” (Proverbs 23:18, NIV). Beautiful, Jennifer. 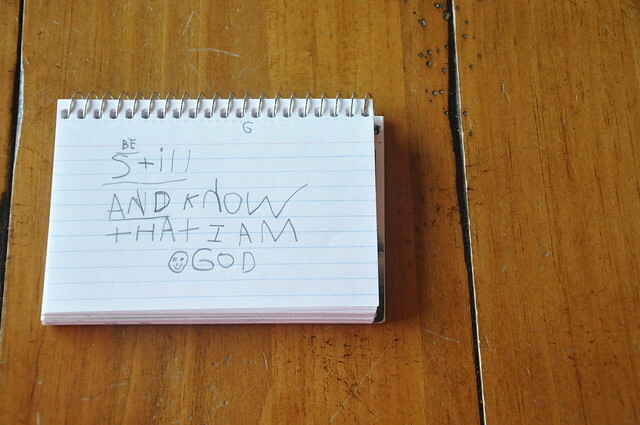 This post reminds me to hang on to my kids’ sweet journals and scribbles- all that growing faith captured on the page. My grandpa was a farmer and I have so many sweet memories from harvest time on the farm. Now that I’m grown, though, I think nothing requires more faith than trusting for harvest–funny, as a little girl, I never doubted that it would come. My heart is so encouraged and nurtured by these words. May the Lord God Jehovah Yahweh continue to make his face shine upon you. Thank you for this, Jennifer — and thank you to sweet Lydia, who, on a day that’s been hard to pray, reminded me how. Can you ask that farmer to stop by? There’s a way those John Deere fellas have about them that no one else does. Oh, I love Megan’s comment. And I was just thinking, thank God for farmers, especially seasoned ones who’ve lived to tell about it. My husband does a strange kind of farming – he invests money, tends it, hovers over it, prays over it and hopes for the best. He was in the business for 40 years and he would always tell new clients, “You’ve got to be in this for the long haul. There are seasons and things we cannot control, but if you hang on and trust the process, you will see a yield.” Interesting parallel. I think I need one of those hope candles. And those hand-scrawled journal entries? Priceless. Oh how I relate to the ebb and flow of crops. Of drought and doubt and our clinging to the cross. The harvest does come. Hope is eternal. Thank you, Jennifer, for instilling hope in all you write.